What Type of Pit Bull Are My Dogs? 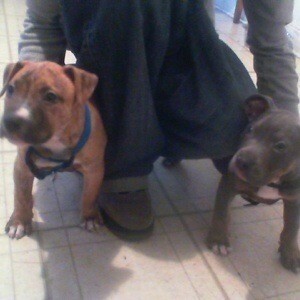 Can someone tell me what type of Pit Bull my dogs are? I'm not sure I understand your question -- as far as I know there are not "types" of pit bulls. Pit Bull IS the type of dog. If you mean coloring-wise, they look Brindle to me. Beautiful pups!! They are just precious! The one on the right looks like a tri color blue and the one on the left. Well, I'd just call it a brendle. The blue could be any where between razoredge grey line and gotti? The other looks more like a game like cowboy eli jeep or midnight, if there from the same litter then there the same bloodline. If they are full grown they are English. If not the one on the left is American. Is a Staffordshire Bull Terrier the Same as a Pit Bull?